Hes my bro. I know its weird but Im a Qiraj. So there should be the triplet emporers. A very fun fight that gets everyone involved. There was a very big sense of accomplishment from any guild that could down these folks. The fight consisted of mad amounts of DPS, extreme sense of raid-oriented-coordination, very skilled healers that could tell who needed heals, and requires everyone to pay attention. One of the most skill sensitive boss fights I've seen. Do not attempt with PuGs unless you know they are commited. Good tip if you are pugging/haven't done - have two pallies at both sides and have them consecrate every 25 seconds so upon teleport there is damage ticking on the caster or the melee boss. This at least helps hold them there. Both emperor's are impossible for a death knight or a paladin to tank as they tank with a mixture of physical and magical damage. Meaning that your threat is less than half of what it should be. That means that the most either can do in this encounter is to deal with the bug adds. He'll be back...oh yes...he will. Vek'nilash makes his triumphant return as a boss in the Trail of Champions! Yes, Vek'nilash is one of the possible memories that can be summoned by Argent Confessor Paletress in Trial of the Champion, released in patch 3.2. These guys were hellish for me on my hunter, even though we wiped hard on them in that fail pug I was in. 90% of my abilities seem to count as "magic" even though they don't get reflected by any spell reflects (and +spell damage is lol-worthy on a hunter) so I could only use auto and steady shot against him, and could only throw arcane shot against the other twin to avoid the dot from explosive shot, even though it was only three seconds. Couldn't use black arrow, or serpent sting, so just stuck with scorpid sting. Had a trinket that helped when rapid fire was on CD...as well as berserk. Being a troll has benefits sometimes. It was just so awful testing to see what would and wouldn't work and watching as it said "Immune" to explosive shot. Kill shot wasn't even part of the equation as we didn't even get 10% down before our tanks' brains hemorrhaged. 500-700 DPS cut down to about 90-200 dps for one fight before we wiped. Jeez, that sucked. These bosses are not a huntard's friend. Didn't help that my pet kept dying because the other twin kept pulling it with his AoE because our tanks were retarded and couldn't keep them apart. I found that for PuGing the twin emps, its best to have 2 tanks (caster and a melee) on each side. 4 total.That way switches are easier. DPS must stay on their toes and swap between veklor and veknilash. This fight is one of the most fun encounters I've ever done, even doing this at 80. Tried this last night as a guild fun run, I took my lvl 80 paladin tank (in ilvl 232 gear), we had about 9 in the group, at first we tried pulling them together and nuking them as has been suggested - complete fail - we just had to give up eventually as we could not out dps there heals. On the second try we attempted to keep them apart and failed again, this time it was simply a case of not understanding the mechanics, and so on switch over they would imeadiatly sprint across the room, passing each other and healing up. Another attempt with the same result made it clear this was not going to be a simple level 80 nuke for lol's and move on, so we took a little time to read tactics and set out roles and positions. On the forth atempt we had a pala tank (me) and a lock tank on one platform with a healer, and a warior tank and a lock tank with a healer on the other, our 2 melee dps were assigned to Vek'nilash, and all the other caster dps were assigned to Vek'lor, everyone was told not to use any kind of dots or AOE. If you want to tank them in the conventional way, warriors by far seem ot have the best threat on them, and no taunt fail issues. Hand of reckoning does not work - but Avengers shield does work as a ranged taunt. Be careful; the aggro after the switch can be very twitchy. In particular, it appears that a high-threat ability used immediately before the switch can dump threat onto an Emperor a split second afterwards (possibly due to latency) causing him to charge over to the other side of the room immediately. I am in agreement with this, speed of pickup after the teleport is the key to this fight, time it right and you can just bat them back and forth happily until the dps get them down, but loose that initial pickup - and they will break loose and cause havoc. Dots of any kind, even from the tank (Seal of Corruption is a no no, I went with Seal of Righteousness). A Paladin can tank Vek'lor with holy spells, but not enough to be dps'd as well, and the aoe knock back with slowing makes this very very dificult, and as a caster he is hard to kite so your back is to a wall. They are immune to taunt, so I also assume warrior taunt will not work as well. Anyway. It's theoretically possible to two man with 2 prot paladins (As far as I can tell), has anyone done it/tried? Downed them today with an all out zerg tactic by out DPSing their heals. Group composition was one warrior (arms), a shaman (enh), a rogue (mut), a paladin (ret), and myself a restoration druid. First of all, with this few people an arms warrior or a hunter is mandatory for the 50% reduced healing debuff. Secondly, to maximize your DPS uptime and make sure you can actually out damage their heal, the melee need to have their backs facing where Vek'lor is at all times - therefore when they switch places he will aggro one of the melee and AoE knockback them right into Vek'nilash. Took a few minutes to get the hang of this strat and lost a ton of damage due to the warrior being knocked away and MS falling off. Everyone's gear was ICC10/frost badge level so nothing amazing is really required. A 6th or 7th head would definitely have helped to smooth things out but, all in all it's entirely zergable with current gear levels fairly easily (took about 12 minutes total). Even at 80 these can sometimes be a pain :(. He also has some kind of Sword Specialization with a chance of doing an extra hit (like the old one or windfury). Not sure if he still has it but i remember some wipes back in the days cause of such double hits right after an unbalancing strike. Good thing to counteract this, was to shield the tank right after an UBS. just two manned as warrior / paladin. just during the teleport do nothing. There's a video of a rogue pulling Vek'nilash alone. The footage is actually pretty useless, he simply runs up to the boss and for some unexplained reason Vek'lor does not join in. - One of the nearby anubis mobs tags along. Since he charges in mounted, it may have been an unnoticed/ignored tagalong, or triggered by the boss since the encounter aggros any skipped anubis trash. It may also be deliberate and part of the exploit. - He plays a rogue but there's no vanish involved. In fact, lolrecupe is insufficient with the anubish around and he flees with vanish, only to engage again without Vek'lor triggering. The video description simply says "Using good timing i pulled Vek'nilash alone" but since his only actions are standing around and standing around, I'm not sure just what event was timed. There's a clever C'thun solo in there too, so "Private server." isn't a very solid theory. I've heard a few more details now that it surfaced on mmochamp's front page. First, it was PTR work. Second, rather than responses, youtube comments upset about the blatant obfuscation are being "removed by author". As more and more people call BS on the pull and there's no statement, "Private server." starts to gain weight. Don't think it's only a dps issue though. To maintain 31k, sounds very impressive btw, is not really enough. That just deals with the healing rate. Then you have to start killing them, and that you would have to do pretty fast since if you can pull that amout of dps you probably don't have a lot of defensive stats. #1 Dps - At least 30k and that is pretty tough atm. #2 Suvivability - You have to survive for a while. They're still boss level and they still hurt. These two points are in conflict. Select classes are no longer﻿ able to aggro and pull a single enemy NPC from a linked group through various measures of sneakiness. This suggests (but does not prove) that Jider may in fact have been able to pull one twin and not the other without being on a private server. Since the hotfix is grouped under "classes", this was something that only certain classes could do, rogues possibly included (being the "sneakiest" of them all, after all). However, it's still only conjecture and does NOT explain HOW he was able to do it or how he could de-aggro the emp to fight the add. That is the explanation that is still missing here. I suspect that it in fact was a bug (which is now hotfixed) and that Jider was aware of this, which is why he has not come forward with a detailed explanation. Id like to mention that if you pull one of the twins in the little opening scene (when theyre taunting you) the other twin will NOT aggro. He'll just sit there and look at the other one. It's probable that this is what Jider used in his solo. Solod on a blood DK using this strat. soloed today (12/30) by a ret paladin. Ilvl 395. Easy enough to do now. It's a total dps race. You don't have to have both magic/mundane damage. Rogue/Hunter maintained solid DPS throughout the fight did more damage than they could heal, we just switched off when they did. I'm utterly confused. I on my hunter and my friend on his warrior (both 85) were trying to take these guys down. I started on the caster, warrior on melee and when they ported I simply picked up the melee and warrior kept aggro on the caster which worked fine, however, on random ports, despite having no dots on him the melee came running back to me on the other side when I have aggro on the caster putting the two bloody things together and creating havoc. Everything works fine, there is no reason for me to get aggro on either of them when they're on the other side of the room as I'm just using steady/aim on melee and chimera/cobra/arcane on caster. Just soloed with ease as a Retribution paladin doing ~33K DPS on them with only Blessing of Might. Just dragged them into the corner and nuked. Pull them to a corner by the stairs so that they wont knock you back. It's okay if they are together. Dps this guy down FAST. DO NOT bring someone who hits less than 14k. They will enrage and you will die. It takes a very long time to kill him so yeah if you have patience give it a go! Unless you hit for 30k *this is based off of damage meters* you can solo it! I've seen a paladin solo it, death knight solo it, and a warrior solo it. How? If you are geared, chances are you can solo everything. Curious tidbit: If you're doing the stack-and-outdps-the-heal method, Golpe necrótico on Vek'nilash will make his health drop faster than his brother's. They both die when one of them reaches zero health, making this and presumably standard Mortal Strike effects a good way to speed the fight up. easy thing to do Just get em in a corner and beat on vek'nilash while tossing outbreak on vek'lor every time its up. On my lvl 85 Undead DK Blacklich i just soloed them on Borean Tundra,posted some screenshots for proof.I just used some potions and spam deathstrike,heartstrike,and runestrike on the mele guy. Aslong as you get the mele guy down past half before the enrage you should be fine. Just soloed as a warrior fury. Patch 5.0.4 item level 384. stand in the corner of the staircase to avoid push ability. Also, if you pull the boss without having killed the anubis mobs in the previous tunnel, you're gonna have a bad time. Just soloed as a 395 Fury warrior. The comments below are correct (especially regarding the Anubisath Swarmguards Guardaenjambre Anubisath, that's no joke), it is a fairly easy fight that only requires a little positioning. 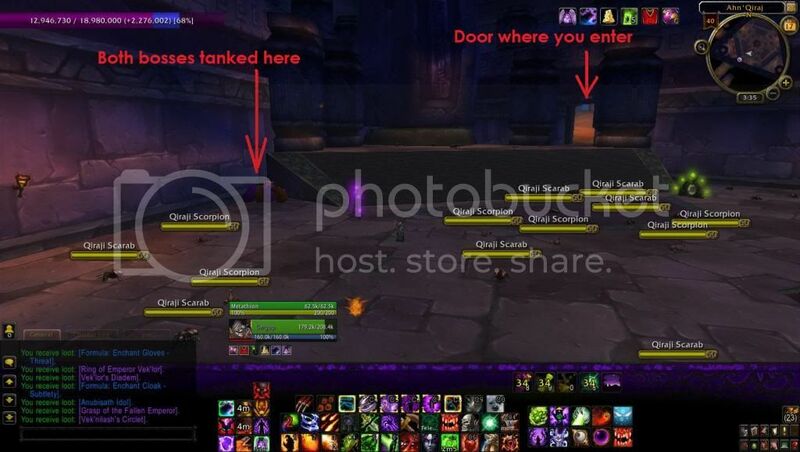 However, when I tried this in 5.0.5, I was consistently getting disconnected if I took the position against the wall at the bottom of the staircase on the far right side. Two punts back to back were a DC every time. It does kind of look like wall-walking, so maybe there's some new anti-exploit check in place here. Instead, take them to the corner made by the pillar and the wall at the top of the stairs, directly behind Vek'Nilash. It's not as tight a triangle so you can be moved out, but it works and doesn't get the server mad at you. As a DK, after the release of MoP, don't try to solo this unless you can crank out over 30k dps (mostly single-target, not including STDs) in blood spec. The ability "Heal Brother" is now used by both of them, and since they share health pool, they are now healing for 60k every 2 secs, whereas it used to be 30k/2 secs. Thanks blizz, for "fixing" this. solo'd as a frost mage. tried to have pet hold aggro on the melee boss. kind of failed. eventually i managed to out dps their heals. Tried to solo at lvl85 as Ret Pally and can confirm now that they double heal (After MoP release onward both brothers now heal, doubling their HPS) you need to be lvl90 to effectively solo. During cooldowns was able to get maybe ~40% of his health down, but during downtime between they slowly healed him back up to full. Should not be an issue at 90 though, as other comments are saying. Ok I just solo'd it with my itsy bitsy ilvl450 hunter. Clear all those big guardians in the other room first. Buff up, set pet on passive and camo sneak behind Vek'nilash. To make things easier put a raid symbol on him. You want to squeeze yourself tight into the corner right behind him, up on the platform. MD pet and fire away. Blow all CDs you have and maintain Widow Vemon. Never ever focus or fire on anything else, bugs will attack you and the twins will switch once but even then do not move from your corner and do not fire on anything else, just wait for Vek to come back into range. You are tough enough to handle to blows, trust me. You'll burn through Vek at a nice pace, just keep popping CDs, use readiness wisely, use widow venom and you'll bring him down. This took me a couple of tries, first time I forgot a couple of the guards in the other room, then I stupidly fired on the other twin when they swapped and this just messed with me, third time the charm. I wasn't very prepared tactics-wise and the attempt was a bit sloppy but I think decent gear and buffs made the difference. By far, the biggest problem is incredible healing from Vek'lor. Need to nuke like crazy but at the same time keep your health up with Recuperate and Shiv, cause in prolonged fight they can take you down. Also used 2xCombat Readiness and 2xEvasion to gain some air and healing potion just to be on the safe side near the end of the fight. Didn't drop pet but it won't be a problem to do it again. Made a few attempts at this as a Lv 90 Enh Shaman, 480 iLvl, but couldnt really get anywhere on it. Damage during the fight is trivial, but there is no practical way to out dps the healing being done with only 2 melee abilities that are constantly being parried, even at exp cap. My best attempt was about 75% with lust and wolves out, but all it takes is one Stormstrike getting parried and all your work is undone. I just solo'd this as a 90 BM hunter (458 iLvL), mainly like how is shown in this video. There really wasn't much I could do in the way of attacks apart from auto-shot, Kill Command, BW when available, and MDing with Multi-Shot/Barrage after the teleport spell (though I'm not sure how effective they were at anything really). The only way I was able to out DPS the healing was to keep Widow Venom up on Vek'nilash at all times. After reading the comments about trying to solo these bosses I can confirm I have succeeded as a lvl 90 fire mage. Pretty straight forward really! I concentrated on Vek'lor and nuked him with Pyro, kept Living Bomb up & fireballed with Pyro proc. Timewarp & Mirror Image helped. The only frustrating part was getting batted around from melee hits. Waspleasantly surprised when both bosses died at the same time! 36k dps was more than enough to do the job. For you Death Knights, you can solo this fairly easily though it takes a while, and can get a bit frustrating. I'm Frost spec, 472 ilevel, and used a rotation of Necrotic Strike, Death Strike, and Frost Strike (other spec related special strikes should be fine, but Necrotic and Death are key). Whittled him down after about 10-15 minutes without coming close to dying. I managed to solo this as a BM hunter with an ilvl of 473 in 1 minute and 42 seconds, after my previous kill of some 12-odd minutes. The trick? Target Vek'nilash(this guy, the physical dps)and burn him to high hell. It'll take a while before his brother gets within range, and hopefully by then you will have gotten his health sufficiently down for you to out-dps the heals. This might be worth mentioning. This guy do NOT drop the Ídolo Anubisath pet. His brother Emperador Vek'lor drops it. This can be quite good to know so you can plan your attacks accordingly so you don't end up killing/looting the wrong guy. DK, ilv472 here, can't do this. I read all comments, tried to burn the melee guy, but the other one just keeps healing him for 30K every 3 seconds ! How can i out DPS this ? Just soloed as a 90 BM hunter. Ignore everything else and keep on him. Send pets to attack him and out-dps his brother's heals. Just keep in mind your pet's health and you are golden. Just solo'd as an Arms Warrior, I didn't need to have SW specced as some have stated, ilvl 471 + reforge + gems. Pulled Vek'nilash, dug into the corner or the staircase and started burning him down. I got Impending Victory off twice during the fight, ran back to the corner whenever I got knocked around, and hammered Cleave whenever I spotted an add. All in all a pretty simple fight without any 'oh shi-' moments. If you're a Rogue, this is much easier as Combat instead of Assassination. Vek'nilash is immune to poison so your SnD will keep dropping off, and more importantly a lot of Assassination's damage is from poisons. Go Combat and kite Vek'nilash around the room. Use Sprint/Shadowstep/etc to close the gap back to Vek'nilash when they swap positions to reduce their proximity healing in this window. He should drop fairly fast. Compared to Assassination anyway. As an iLvl 455 Blood/Frost DK, could not solo the twins. Tried switching to Frost to out-dps Vek'nilash, but couldn't pull it off. Healers-Have-To-Die addon was going crazy on both twins, so I guess they heal eachother. From what I'm reading here, ranged dps seems to have better luck, as well as higher iLvl geared plate wearers. Finally managed to solo this as Enhancement Shaman, even with the 'fix' that makes their healing even higher. I pulled them to a corner, beside the stairs. This way, I can line of sight Vek'lor until he comes very close. When the first teleport occurs, Vek'lor comes to melee range and Vek'nilash gets his place a little farther, but then both are within melee range. Also, in that position, Vek'nilash can't kick me away, so I'm always within melee range. 1) Was using Windfury Weapon on both weapons and ALWAYS attacking Vek'nilash. 2) Was mainly using auto-attack. Used Stormstrike and Unleash Elements the instant they got out of CD. 3) Kept Magma Totem up at all times. I wasn't keeping track of Vek'lor's health, but that seemed to help reduce their healing (maybe when Vek'lor's health wasn't full, the healing didn't splash to Vek'nilash. Maybe). 4) Whenever I had Maelstrom Weapon at 5 stacks, I either healed myself with Healing Surge (+glyph of Healing Storm) or used Chain Lightning (which missed on Vek'nilash but splashed to Vek'lor and whatever scorpions that wandered in). Again, I wasn't keeping track of Vek'lor's health, but this seemed to help. 5) Popped Bloodlust, Lifeblood (herbalism), Elemental Mastery, Feral Spirit and my Agility trinket (basically, anything that boosts your melee damage and speed should work). This way I managed to get Vek'nilash to about 1.5M pretty quickly. 6) Sometimes, when I wanted to Chain Lightning some more, I used Ancestral Guidance and Healing Stream Totem to help me out on health. I used Life Spirit (heals 120,000 - herbalism) once and it saved me some more Chain Lightnings in a row. 7) Whenever melee cooldowns were active, I used them. Same for Feral Spirit. Now, when I popped Feral Spirit, I had to be sure to have Stormstrike and Unleash Elements out of CD, so I could imediately hit Vek'nilash hard enough to avoid losing threat for the wolves. If they grab aggro, Vek'nilash may kick them away and then move to where they landed, screwing the whole thing by getting out of position. 8) I kept going and eventually Vek'nilash got to about 950k health. That was 10 minutes later, when my Bloodlust was again out of CD, and I could pop everything again and down him to about 200k. 9) I kept doing the melee cooldowns whenever able, Feral Spirit, Chain Lightning and Magma Totem, and about 2 min after the second Bloodlust Vek'nilash died. Phew... I was tired. - Earth and Fire Elemental Totem. Fire probably would help, although I didn't use it, as it would replace Magma Totem, which I didn't want to replace. Also, the Fire Elemental could have screwed by grabbing aggro, since I wasn't hitting with my full force. Earth Elemental just sounds like a horrible idea, since he taunts, so I didn't use it either. - Ascendance to hit Vek'lor with nature damage. Didn't work because I just spent time hitting the wrong boss, and Enhancement can't keep magic damage all the time. I gave up and just focused on physical attacks. - Flame Shock on Vek'lor. I used some of it on my successful attempt at the beginning, but then I realized I often 'tabbed' to scorpions, and that only made me lose physical damage time. If you're awesome in switching targets, maybe this could help. This fight was ludicrously easy as a Ret Pally. I pulled him into a tight corner and unloaded. I didn't even notice I had Seal of Insight on until about halfway through the fight. He caught a few heals from Vek'lor, but my damage was high enough over time to mitigate their effect. Twice during the encounter I was somehow booted across the room, despite having my back to the wall, but no biggie. Made sure to thump Vek'lor once to get his loot, too. After it was over, I sat back in my chair and chuckled...the Twin Emps almost shattered my old guild back in the day, and there I was, standing beside their corpses after soloing them. Times, they are a-changin'. Your goal is to land as many Necrotic Strikes as possible on Vek'nilash. This is achieved through Death Strike activating Blood Rites which makes your next Frost/Unholy rune a Death rune when activated. Make sure to keep your back against the wall / in a corner to prevent knockbacks yada yada. There's nothing else to it really. Sometimes they swap positions, I just stay on the spot and wait for him to come right back. Tap Vek'lor once before killing Vek'nilash for loot. Some outdated info here...the brothers no longer heal each other for 30K/tick, or at least not as often. I soloed this as a level 88 fury warrior tonight, and I was only averaging 12-14K dps. It was a long fight, but not obnoxiously long, my rough estimate would be 6-7 minutes. I had tried this as a fresh 85, doing maybe 8-9k average DPS, and couldn't get through their heals, so I'm guessing 10k is probably the break even point. EDIT: just did this again on my Warrior, and while the Emps do heal for 30K, the ticks are spread out. Although, in my combat log, the timing was somewhat erratic, with some heals two seconds apart and others as much as five seconds. Also of note, and as someone else said below, they do heal each other separately, both for 30K. HOWEVER, since I was only damaging the one brother, the other's heal was counted as overheal and so was essentially wasted. 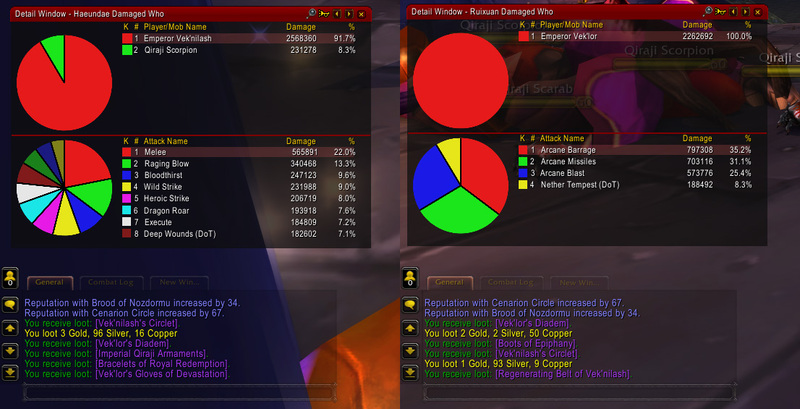 This is important to note if you are doing this on a mixed damage type class--I tried this on my 87 frost DK, thinking it would be easier, on account of being able to damage both brothers at the same time. But it essentially doubled the healing I had to get through. Guess I'll have to wait until 90 to do this on my DK. Just solo'ed this tonight as a level 90 human warrior. I backed them both up in a corner with me having my back against the wall. No matter how much they kept me catapulting in the wall I kept damage on them. No matter how often they switched places they were still on top of me. I just kept bashing the dps and eventually he started to lose more health than gained through the heals. Took a good 8 mins and I spammed all my buttons mostly, but I finally used Bladestorm and took them both out at once. I just added a similar comment to this on the other Twin's page as the strategy is essentially the same. Your focus/main target for damage will be the only real difference and the following information applies to both Emperors. This is indeed Soloable as DK if you go Blood spec, blood pressence and just have some DPS gear on. easy as pie just takes a while i killed em with 17k dps and some undead minions. If you don't know how to defeat them, all I'm going to say is out DPS the healing. Still possible to kill as lvl85 BM hunter, downed after 9min and 41sec (15min berserk timer). Gear: ilvl373 (full season 10 pvp set, 450 bow and 415 neck and rings) using spirit beast cat, exotic (ferocity). Talents used: Spirit bond, Thrill of the Hunt and Lynx Rush. Glyphs used: Mend Pet, Mending and Misdirection. I was able to ignore most of the critters spawned, just had to put down a trap or kill them when the fight was close to me using the Lynx Rush talent. I had a few tries first trying different pets. Tanking pet did too small damage. Widow Venom was up all the time for 25% healing reduction, very important due to berserk timer. Mostly spamming Arcane Shot, Beastial Wrath macro using all the offensive spells possible incl. trinket. So this fight is really annoying no matter the spec or class. So here's what I did to kill these annoying bosses. I started playing this game since right before BC, so my knowledge of this raid was not so substantial. So when I first went in I did not see the emperor on the left, just the right side. So I charged in as Frost Spec, and low and behold her comes the other emperor healing the first one. I couldn't overcome the heals in this spec. I noticed on my last yet successful attempt in Blood spec that these guys were immune to my diseases. So that could be why my Obliterate was not hitting as hard. My successful attempt was when I switched to Blood and started spamming Necrotic Strike after I had used Death Strike to get my Death Runes required for Necrotic Strike. This absorbed most or all of the healing. I pretty much rinsed and repeated the whole process. The annoying part was when the brothers did the switch and the one that I was attacking, the melee brother, would go after my blood worm and the healing brother would blast me away. So I had to do a little chasing. Eh... as an Enhancement Shaman this was a bit confusing.. There is a special system to kill these two bosses easily in only a couple of minutes. Target Vek'nilash and hit him with a ranged shot or spell. Retreat to the door that you entered (now closed) and stay very close to it. When the two emperors come for you, keep hitting Vek'nilash with everything you have got. You will see his HP falling rapidly without his brother's healing having substantial effect. In less than two minutes the two emperors will be dead. I can confirm this system working twice and solo with my level 90 enhancement shaman. In my third attempt to solo this, I switched targets and targeted the twin that came close to me at any time. It was Vek' lor. The system worked for him too. His HP fell rapidly and when he pulled away, Vek' nilash came and I targeted him two. When he pulled away and Vek' lor came I targeted Vek' lor. Strangely, Vek' lor's HP were pretty low though as if his brother was not healing him (probably because he was busy fighting me). I kept hitting Vek' lor and soon the fight was over. It took me about 4 to 5 minutes this way and I had lost about 1/3 of my shaman's HP. Fourth solo attempt to run the dungeon in a single session. The system works. Twins are defeated the same way. This attempt, also game me the Linaje de Nozdormu achievement. If you are a 90 feral druid this fight has no tricks, just out-dps the heals with all your burst damage and feral charge back to this guy when they switch places. It does help to keep moving back a little at a time, the distance dims down the heals and makes this a bit faster. Make sure to clear the mobs before the room though as they can be painful in high enough numbers - enough to make this a pain in any case. Keeping DoTs up is key. This could really count for any melee class though too! After hitting on them for 22 minutes they finally died. It seemed they healed less often when they hit berserk but I could be wrong. One of the most boring fights I've ever done, alone. I remember doing this quite a while back in burning crusade and it was quite "easy". Never had the pleasure of doing any of these old raids when they were new. Might add my dps was a whooping 11k during the fight. less than 10 min fight Spamming Obliterate/Death Strike/Death Coil. 1. Position - (ALL Melee classes/specs) - DO NOT GO TO VEK'NASH SIDE EVER. He is your target though. Hit Vek'Lash once to loot after kill. then wait for Nash to come over. On the Lash side only there are nooks at platform pillars. These will ensure you never get bounced out like you sometimes do on lash side. Place your rear facing the nook, set focus on Nash spam as above. I popped army to start. Ghoul and used Death Pact once. ilevel 512 no buffs other than Horn. So try not to fall asleep watching for the switches (although you could just listen for them) and hope for 1 of 2 cageable companions. etc. After reading many of the comments here, I anticipated this fight taking several minutes and potentially running into a few issues.... but this was not the case. So I thought I could maybe put a few people's minds at ease. On my Feral Druid ilvl 512, I stealthed behind Vek'nilash, Berzerk-SR-Ravage-Rake-Shred-5cp Rip-Shred-5cp FB = Vek'nilash dead. He did receive one heal but was dead before Vek'lor could get to our side of the room. The fight was over before the 12 second Savage Roar ran out. Solo'd as a lv 72 hunter rather easily. Have pet attack one on one side, you focus on the other one on the other side, keep them separate. Your pet will not die, you will not die. When they teleport swap, make sure you target the one your pet is supposed to attack and hit Ctrl+1 to keep your pet and its target on the other side of the map. Focus on the one in front of you. I do not think that they healed each other the whole fight, perhaps because of the distance I kept them at. Fought and died. L94 mage solo. The door seals when the fight begins. I let them kill me finally. It was too much for me. Going to look for a friend. Funny enough, his corpse is immune to Loot-A-Rang.